On my second day in Rome I took the Metro south to the Cinecittà studios, the largest film studio in Europe, where Fellini filmed his movies, and where many American movies have been filmed, including Ben Hur, Cleopatra, and The Agony and the Ecstasy. More recently, the BBC/HBO production of the popular series Rome was filmed there. Unlike Universal Studios in the States, Cinecittà is NOT a theme park: instead, it's still a working studio and has many interesting exhibits about filmmaking, along with tours of the sets. Scorcese's Gangs of New York was filmed at Cinecittà, but unfortunately a fire in 2007 destroyed many of the sets from that film. We saw a few of them, as well as the sets used in the filming of Rome, which were being set up for a wedding while we were there....I can just imagine what that cost! I recently watched Rome on DVD, and many of the scenes were fresh in my mind, so it was cool to see where they were filmed. That evening, I took the H bus over to Trastevere, to stroll the familiar streets of this bohemian quartiere of Rome. One of my objectives was to try, once again, to hit a unique store that in English would be called Books, Chocolate and Wine. I had been by the store numerous times in the past, but never when it was open. It's an odd little store, and not very attractive inside. 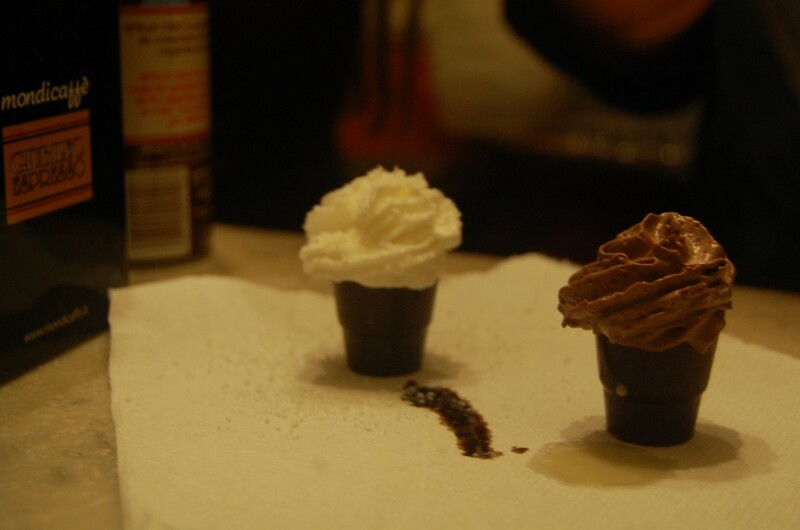 But they serve something very unique: liqueurs in edible chocolate shot glasses. I ordered one called Scapatella, with hazelnut liqueur, topped with panna (whipped cream). The waitress told me to place the entire concoction into my mouth, all at once, and then enjoy the explosion of flavor. YUM! Certainly worth another visit! The next morning, I got up early to visit Palatine Hill, the most central of the seven hills of Rome, a Roman ruin site that I'd not yet visited. I got there just as it was opening at 8:30 am, and had the place to myself for the first thirty minutes. It's a large, sprawling site, one of the most ancient parts of the city. According to legend, the Palatine Hill was the location of the cave where twin brothers Romulus and Remus were found by a she-wolf that kept them alive. When they were older, the boys decided to build a new city of their own on the banks of the River Tiber. However, during a violent argument between the brothers, Romulus killed Remus, and named the city Rome. I spent several hours wandering around the site, and enjoyed myself, as it was like being in a huge park. However, at times I found it frustrating to find my way around, as no maps were provided, and even though I had a printed guide to some of the most interesting spots, the signs were often confusing or misleading. I never was able to find the spot designated as the hut of Romulus and Remus. Included in the ticket price one can also visit the Roman Forum, but since I'd already seen it several times before, I headed back to the hotel to get ready for the wedding I would attend that evening. I even recognize some of the places you mention: how cool is that. Glad you found the place with the liqour and chocolate shot glasses. Thanks for the pictures/ descriptions. I'm glad part of your trip is a lot more relaxed than Rome is.